Idiot liberals like to vilify guns, treat them as the sole cause of mass violence in this country. The obvious truth is that there are far deadlier methods a determined attacker can use during a rampage, and it’s about time the moronic gun-control knights educated themselves: Banning the AR-15 won’t stop Jackie Chan if he ever wants to take out 30 people with a mop. Leftists are deluding themselves if they think Jackie Chan needs a gun when any mop he grabs is a dangerous weapon capable of taking down dozens of attackers. Dumbocrats can put on a big show banning bump stocks and high-capacity magazines, but none of that will do any good against Jackie Chan and a dirty mop he found propped up against a wall. Without any background check or three-day waiting period, Chan is free to twirl the mop above his head like a quarterstaff, painfully bonking everyone around him on the head. In so many ways, a mop in Jackie Chan’s hands is even more dangerous than an AR-15, because he can use it to scrub someone’s face and fill their mouth up with bubbles, leaving them incapacitated as they try to get rid of all those toxic suds. The whining from the left to ban assault weapons only distracts from the real problem, which is Jackie Chan using a mop handle to pick up a bucket and whip it on someone’s head, causing him to clang into another guy, knocking them both out. Even if you confiscate every gun in America, you won’t be able to confiscate the mop from Jackie Chan, because if you try to grab it, he’ll toss it at you, forcing you to catch it, and then he’ll swiftly tie your hands together with the strands of the mop head, and wedge the other end of the mop into the belt buckle of another person so the two of you are connected at mop length and holding the mop off the floor at waist height. No amount of anti-gun legislation can stop Chan from sliding below and leaping over the suspended mop to block attacks with the mop’s wooden pole, nor prevent him from hopping onto the mop and balancing on it with one foot while he roundhouse-kicks all six people rushing in to help you. All the while, you and the other ensnared person are spinning around in circles struggling to free yourselves from the mop Jackie Chan trapped you in, further proving the uselessness of gun control. 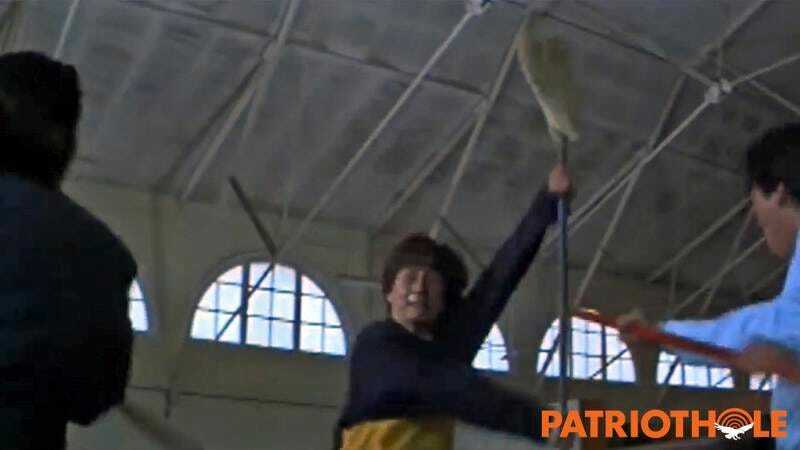 The whining from the left to ban assault weapons only distracts from the real problem, which is Jackie Chan using a mop handle to pick up a bucket and whip it on someone’s head, causing him to clang into another guy, knocking them both out. We need to be using our energies to figure out how to distract Jackie Chan, like bumping a terra-cotta warrior near him, giving people time to escape while the statue teeters and Chan frantically struggles to prop it upright. So why can’t liberals admit that? Let’s leave the Second Amendment alone, because Jackie Chan’s violence isn’t caused by guns but by his quick wits and desire to get out of trouble. It’s time that we dispel the leftist myth that guns are bad, and all agree that Jackie Chan plus a mop is an unbeatable combination that presents a real threat that can devastate a community at any time.